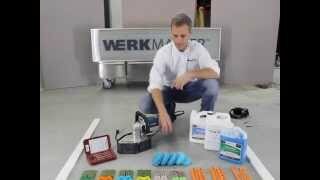 (PRLEAP.COM) May 7, 2014 - Vancouver, BC - WerkMaster releases new DIY How To Video showing the steps required to remove Epoxy and Polish Concrete with handheld Scarab concrete grinder and polisher. Many of our customers have asked to see just what the Scarab is capable of when faced with concrete surface preparation and polishing concrete. You may be pleasantly surprised to see how a small handheld grinder can easily and effortlessly remove epoxy and polish a 6.5 hardness concrete floor to achieve a Gloss Meter Rating of 66! Find out more about the Scarab's benefits on granite, marble, quartz and concrete countertops, hardwood, concrete and terrazzo floors, micro toppings, overlayments, wood decks, swimming pool restoration, boat polishing, bottom paint removal, and other various surfaces and benefits. Please watch for our upcoming videos on How to Polish Ardex PCT Overlayment Self Levelling Toppings, as well and some polishable micro topping concrete products. We recognize your time is valuable, so on behalf of the entire WerkMaster Team, we would like to thank you for taking time out of your busy schedule to view this video.